One night in 1947, years before becoming a leading avant-garde artist in post-war Europe, a 19-year-old Yves Klein sat on a beach in his native city of Nice, France, with two of his close friends, Armand Fernandez and Claude Pascal. There, the three young men decided to divide the world up amongst themselves. Armand chose the earth and all its riches, Claude chose the air, and Yves chose the sky and infinite space. This moment on the shore proved to be a defining moment for Klein and inspired one of the fundamental themes of his work: expressing the boundless, immeasurable, and immaterial. Though Klein’s artistic career was brief, his ideas and artwork had a significant impact on the future of contemporary art. While Klein painted in many different colours, blue was without a doubt his favourite. He felt that, unlike other colours, blue was without dimension, and therefore, beyond it. 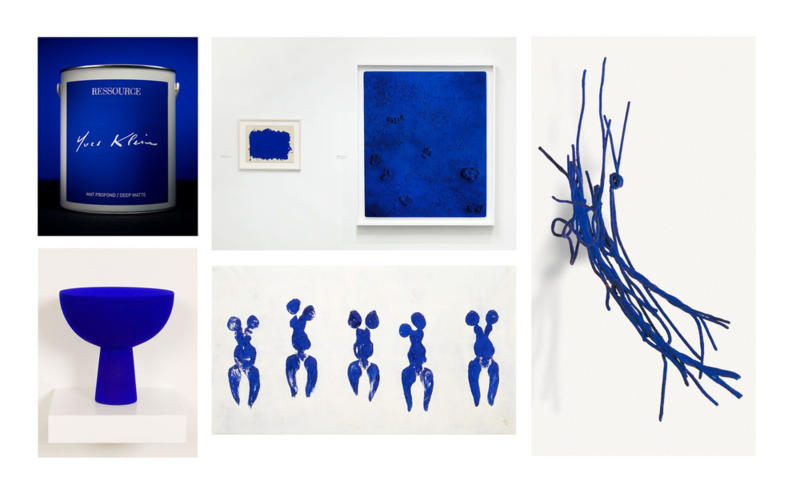 “Blue suggests the sea and sky, and they, after all are in actual visual nature what is most abstract,” he said.1 Wanting to capture the limitless quality of blue, Klein worked with chemists to develop and patent his own signature shade, a vivid, ultramarine hue called International Klein Blue. In order to solve the problem of binding agents in the paint dulling the intensity of the pigment, Klein had a clear binder made that preserved the pigment’s original brilliance. Looking at this beyond-bright hue, the viewer loses their ability to perceive depth and gets lost in the stunning boundlessness of blue... just as Klein had intended. 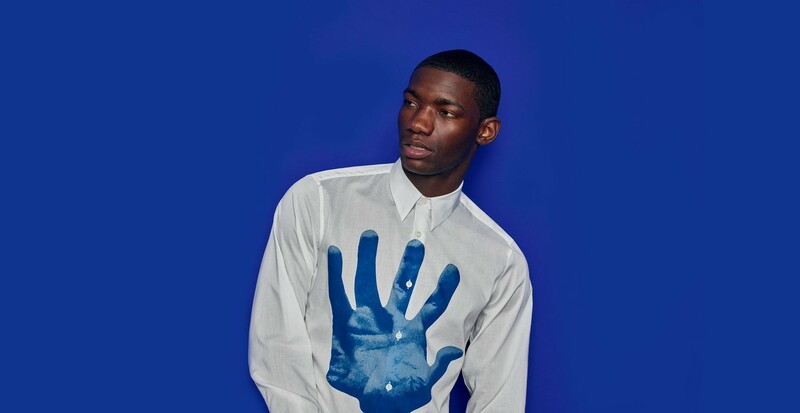 At Simons, we believe that art and fashion go hand in hand. Both make the world a more beautiful place, spark new ideas, and spur the imagination. 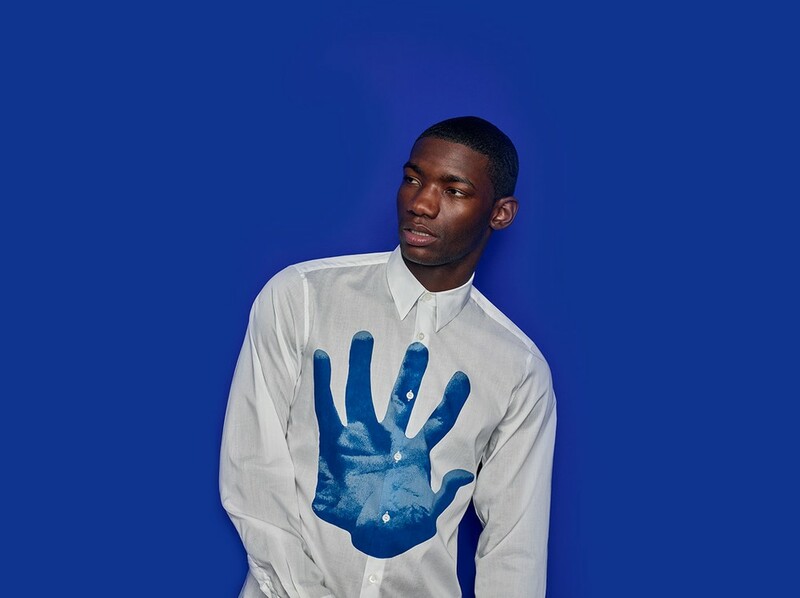 When we learned that the Yves Klein Archives was teaming up with the French paint manufacturer, Ressource, to release an Yves Klein paint for the artist’s 90th anniversary, we couldn’t wait to celebrate their new boundless blue hue along with the boundless creativity of fashion's leading names found in our curated collection of designers. Shooting our Spring 2019 Designer Campaign, an ode to the spaces that feed artists’ imaginations and allow their creativity to flourish, provided us with an exceptional opportunity to do just that. 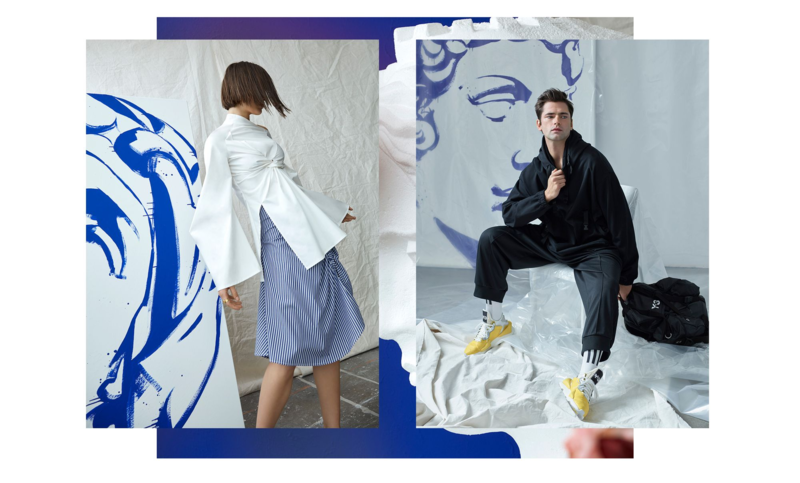 Set in an artist’s studio, we see white, blue, and clear tarps protecting the furniture, walls, artwork, and even the models themselves from splattering paint. 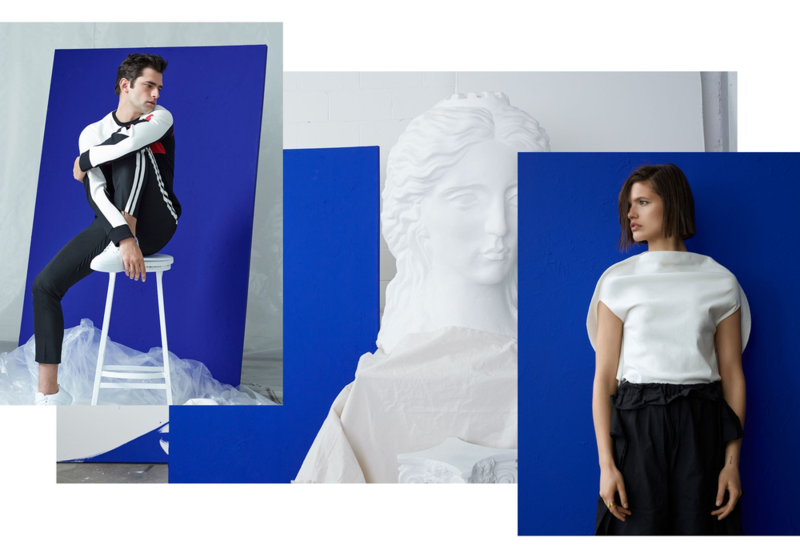 Are models Julia van Os and Sean O'Pry posing for the artist or for the photographer? It’s hard to tell. In the studio, there are three canvases painted with the Yves Klein shade. One is a monochrome that pays tribute to these groundbreaking works of art that Klein produced during his lifetime. When used as a backdrop, the vivid colour creates a striking contrast with the clothing. In fact, even when this luminous shade appears in small doses, all other blue hues in the picture instantly pop. 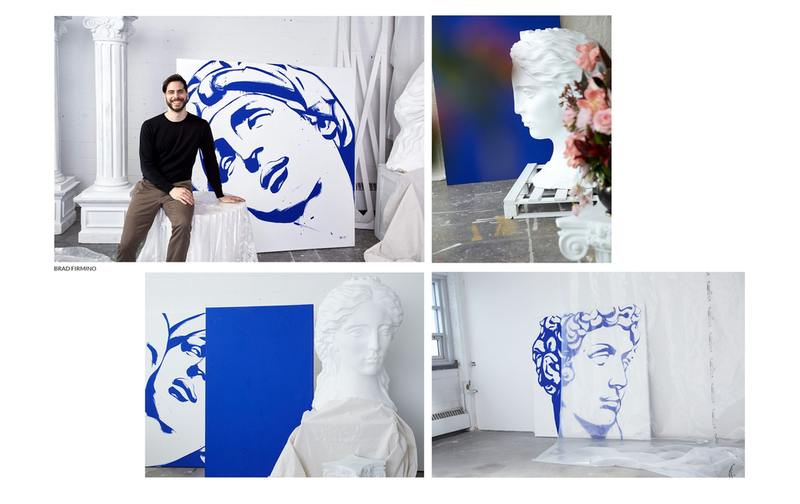 On the other two canvases, Simons asked Montreal-based artist Brad Firmino to use the same shade of blue to paint breathtaking portraits of Dawn and David, two spectacular sculptures by the Italian master, Michelangelo. This was inspired by Klein’s work, Samothrace Victory, where he covered a sculptural replica of the famous Hellenic statue, Winged Victory of Samothrace, in blue. Our two paintings reproduce what Klein did quite literally, thus becoming a visual representation of a play on words. Klein painted a sculpture in blue, and we did too. 1. 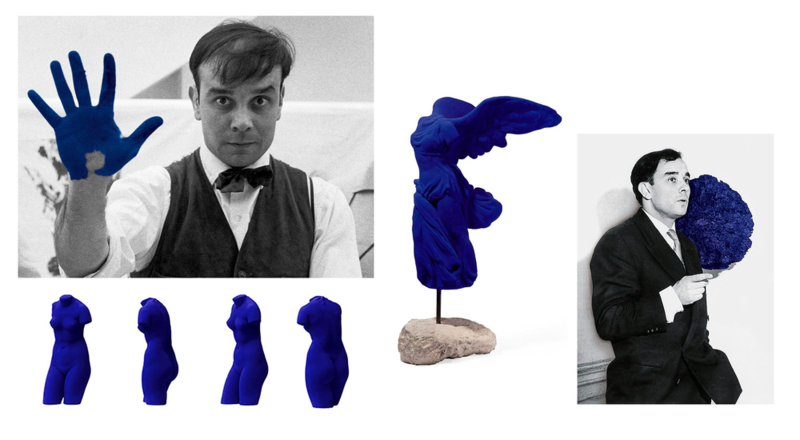 “Yves Klein (French, 1928-1962),” artnet, accessed February 28, 2019, http://www.artnet.com/artists/yves-klein/.